I was dumped on a rural road in Caswell county and rescued on November 6, 2016. I have abrasions on my nose and chin (probably from hitting the pavement) and injuries to my legs. Sparkle Cat Rescue does not have an office location for visitors. If you wish to meet any of our kitties, an approved adoption interest form must be submitted. From time to time our supporters will send us a message requesting to meet kitties when they drop off donations. ​our mailing address is a secure mailbox only. ​All cats are in foster homes. "There is no greater way to reduce pet over-population and suffering. Spay and neuter is the number one thing you can do for your pet's health and the well-being of those around your pet. Spaying and neutering reduces, if not completely eliminates, the chance of testicular and ovarian cancers in animals. It reduces or eliminates behavioral problems including, but not limited to, aggression, marking behaviors and going "into heat." Not only are the health and wellness benefits great, the cost alone is enough to convince you. A litter of four costs well over $2,000 once all care and maintenance is said and done. Sadly, most puppies and kittens of accidental pregnancies do not get care because of cost, so they end up sick or homeless (or both). In 2011, we helped over 200 families to spay and neuter their pets. "You can improve the lives of outdoor cats with Trap-Neuter-Return, the humane and effective approach for feral cats. To successfully trap, neuter, vaccinate, ear tip, and return feral cats, you need a plan. These guidelines for humane trapping from Alley Cat Allies, the organization that helped introduce TNR to the United States, will get you on your way! "I love Sparkle cat rescue because they like dogs too." ~Tara R.
"I love Sparkle Cat Rescue because not only can they help place healthy cats/kittens but they also can help with placing special needs cats/kittens!!!!" ~Bridgette S.
"I love Sparkle Cat Rescue because they rescue animals and find new furrever homes and a new life of happiness." ~Peggy L.
"I love Sparkle Cat Rescue because they are a great voice for the often forgotten cats and kittens! what a great benefit this will be to our community." ~Kim B. 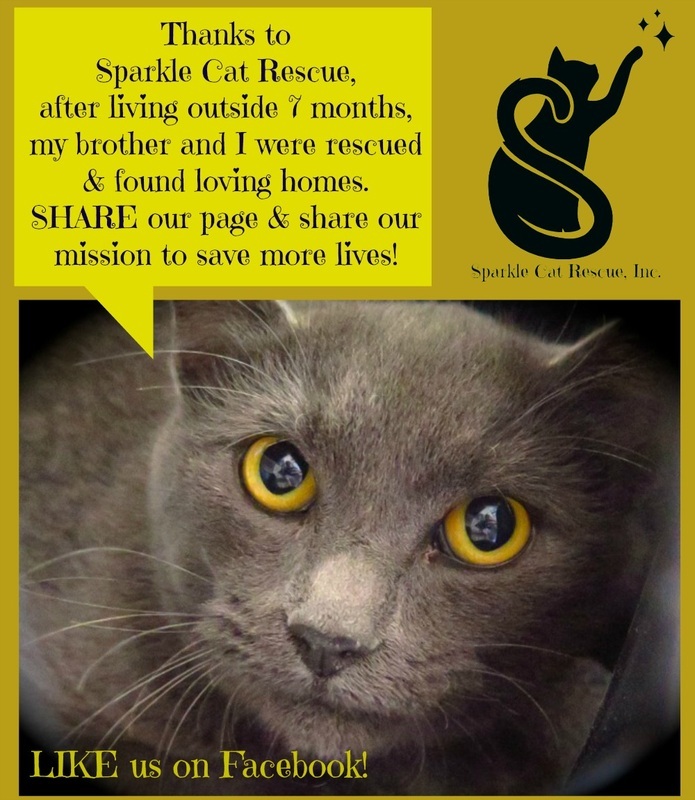 "I love Sparkle Cat Rescue because I love cats! And I feel bad for every homeless cat that I see. I wish I could take them all myself, but since I can't, I love the work that rescues do." ~Maris F.
"I love Sparkle Cat Rescue because cats can get overlooked and a rescue with the sole purpose of helping our felines is awesome!" ~Shannon M.